Our range of most innovative & DIY (Do-It-Yourself) kits have something for every child. Kids as young as 4 are inspired to make, craft, code and invent.True education that’s playful & stays forever. Kids learn and explore electronics & simple robotics to make this scribbling robot. Have fun drawing patters and geometric shapes with this cool kit. Make a friendly, bug like robot that works like an intelligent machine. The robot uses its two antennas to find and avoid obstructions. Kids learn and explore with the world of real robotics with our Little Hero Platform. Bring the worlds of electronics, sensors, micro controllers and computer science together with child friendly ‘Scratch Like’ GUI coding platform. Awesome projects that kids can make with their kits, bringing opportunities to keep playing, inventing, learning & tinkering. 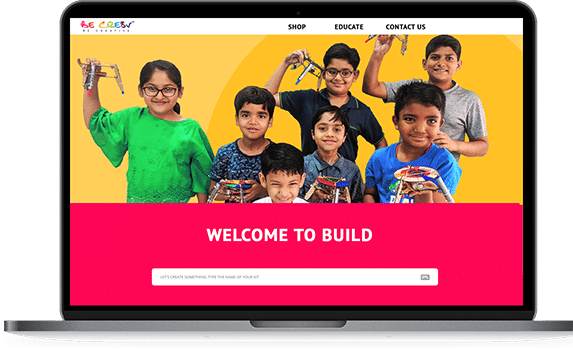 Our STEAM (Science Technology Engineering Art & Maths) Based products utilize Robotics, Electronics, Science, Junk Jugaad, Art, Design , Coding etc to inculcate educational concepts into a child's mind. All of it through playful & fun ways. From coding first-timers through to tech wizards – our platform is designed to empower kids to learn from anywhere. Using our Step-By-Step Instruction & ‘How it works’ sections with educational quiz & challenges, we remove all barriers to child’s creativity & imagination. My son loves every bit of it - a must do for all the curious minds. The joy of creating things together and watching their little machines move surpasses any fancy toy you can get! We are on mission to inspire all kids to be creative & inventive. Our play experiences are focused on kids learning about the world through STEAM and play. Education should be fun, bridged through activities & experiential. From making cool robots, to creating art, animation, stories, from coding to making machines, we unleash a child's creativity on various mediums.Gradually evolving them into creative problem solvers, critical thinkers & happy beings. Please fill the form our team will get back you soon..